You have internal and external users. Your agents and other support staff are your internal users. Your end-users are the people to whom you provide support and whose tickets you manage in CUGIC Support. These are your external users. While your support staff must sign in to your CUGIC, your end-users may not have to depending on how you set up access to CUGIC Support. You can also restrict the external users who can access your CUGIC Support instance. For example, you might want to allow only end-users from a specific email domain and then reject all others. You can set up your CUGIC Support access to be completely open to all users, restrict it to a specific group or groups of users, or close your CUGIC Support instance and only allow the users you add to your CUGIC. Open means that everyone can see your Help Center and submit support requests. This is the configuration you'd choose if you, for example, sell products and provide support to the general public. A user submits a support request and a new user account is created in your CUGIC. Closed means your Help Center is visible to everyone but only the users that you add to your CUGIC account can sign in and submit support requests. Each user's account must be created before they can submit support requests and signing in is required. This is typically how an in-house IT help desk would configure their CUGIC Support instance. Restricted means that your CUGIC Support instance is visible to all users but only users with email addresses in domains that you approve are able to successfully submit support requests. All other users' requests are rejected. This configuration allows you restrict access to CUGIC Support but also allows your users to request support without first having been added to your CUGIC, as is the case with a closed CUGIC Support instance. You can require that your end-users register before they can begin a conversation with your CUGIC Support instance. This means that users must first register (sign up) with your CUGIC by providing their name and email address. 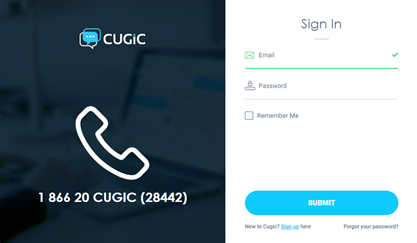 After signing up, end-users receive a welcome email message that prompts them to verify their email address and also create a password so that they can sign in to CUGIC Support. By requiring your end-users to register, you help to ensure that the support requests you receive are legitimate and not spam. Registration is not a guarantee that spam won't get through to your CUGIC, but other tools are provided to handle those that do manage to get through. See Managing suspended tickets and spam. Comment on articles in Help Center, participate in community discussions, and more. Update their user profile and add additional contact information (email addresses and social media accounts) so that they can submit requests from any of these accounts and CUGIC will pair them to their CUGIC user account.